Action camcorders are the new kid on the block as far as technological toys among cameras and camcorders. These devices are great for those who enjoy outdoor activities like biking, hiking, rafting, snowboarding, rock climbing, zip lining or any other high adventure activities. From your child’s soccer game to skydiving from an airplane, action sequences are some of the most enthralling moments to capture on video. But if you want to make all your friends jealous on YouTube, you better have the right camcorder for the job. Otherwise, your action videos may turn out to be just as blurry as your memories. Action camcorders are great for capturing action shots at children’s sporting events, you are able to put the camcorder on your body or on your equipment to get the best action shots while you participate. Now no longer must you spend hundreds of dollars in order to take quality action videos. The camera is no longer assigned for those sitting on the sidelines. Now you can join in on the fun and achieve video and photographs like never before. The ability to take hands free video from a compact unit has taken filming to new heights. Most action camcorders are rugged and can withstand dropping, falling, and even operate underwater. They can be mounted on your body or on devices, allowing you to film from convenient angles while you enjoy participating in the activity. Now you are able to capture a videos of you rock climbing as you scale the mountain. You can go caving video your children swimming under water or view the top of the mountain without having to get the camera out to take a picture or video. Wi-Fi capabilities also give you the option of operating the camera remotely for a true hands free experience. In the past such videos would be dangerous if you were required to use your hands making it so photographers were often sidelined from participating the in event or activity. With this new technology you can now enjoy taking pictures as well as video from this mounted device. Given their versatility and wide applications action camcorders have grown rapidly in popularity and resulted in a wide range of products to choose from. Now you can capture every image imaginable through these affordable devices. The AKASO is the top pick because it offers everything you need to take quality action videos. This unit comes with 15 accessories plus the camera and waterproof housing. The camcorder is both lightweight and versatile allowing you to film nearly anywhere. You won’t miss any action whether you are filming a child’s sporting event or an underwater snorkeling adventure. Bring it with you for white water rafting or rock climbing and see videos like you have never seen before. You are able to capture the moment, as you are seeing it, even in rugged environments. The 140 angle fish eye lens captures life like video with the benefit of a wider angle. The AKASO is a waterproof up to 131 meters and gives you pictures up to 16 MP and full 4K video. The 2-inch screen gives you a way to easily view both during and after filming. It comes with a carrying case that is also shockproof ensuring your equipment will not get damaged. The filming features loop recording, giving you continuous video even if the SD card gets full. The video will then ‘loop’ around and record over older videos. This option can be turned off to prevent deleting previous videos you wish to keep. The camcorder also features Wi-Fi giving you the option to use a Bluetooth for transferring data to a smart phone, laptop or other electronic device. The camera can be controlled remotely. This kit comes with an optional 8 gigabyte SD card for easy transfer of images. The battery and charger, the camcorder and waterproof housing, a carrying bag, tethers, mounting devices and clips and bandages for different mounting devices, a head mount, clamps for a tripod and bike, and suction cup mounts. 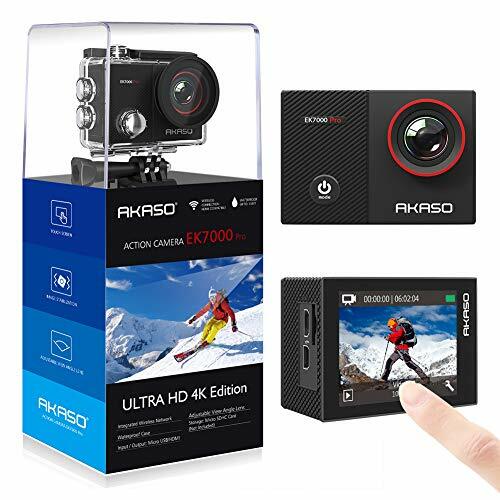 The GeekPro Waterproof Sports Action Camera Camcorder is a top pick because it comes with high quality video along with a camera option. So whether you are taking pictures or creating an action packed video recording the GeekPro with give you memories that last a lifetime. The camcorder comes with up to 12 MP while in picture mode along with full HD 1080p video. This waterproof camera can take underwater videos up to 30 meters deep. The 2-inch screen allows you to see the action while you are recording and make adjustments. The unit also includes audio and a 140-degree wide angle fish eye lens which allows you to record all the action going on around you. The camcorder offers continuous loop shooting, that will wrap around and delete previous video if the SD card is full. It will accept SD cards up to 32 gigabytes. This feature can be turned off if you prefer it to stop recording when the card is full. It also offers a time lapse feature for delayed shooting. Also included is WiFi capabilities through a convenient iSmartDV app allowing you to view video on your phone, tablet or laptop. This offers compatibility with both iOS and android devices. There is also a 2.0 USb outlet and a mini HDMI port for viewing on your television. 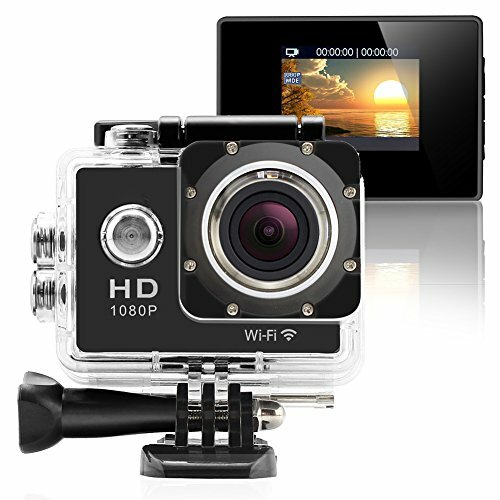 Included with your purchase are the camera, waterproof case and mounting devices. SD card and charger are not included. The GeekPro comes with a one-year warranty. Action cameras have become very affordable as more companies come to market with quality products. Our top picks all offer water proof shock proof camcorders that operate in up to 30 feet of water. The all accept up to 32 gigabyte SD cards with loop recording. Each will give you the ability to take both pictures and video. The photos are good quality with up to 12 MP and the video is full HD up to 1080p. The key differences is in the accessories that are included with the devices. For a complete kit including case, carrying bag, SD card and a ready to go out the door package out top pick the Geek Pro is your best pick. If you don’t want the carrying case and SD card, then the Geek Pro gives you the same quality camcorder without all the bells and whistles. The Akaso offers a quality camera and housing without the battery or SD card. Any of our top picks will give you quality on the go videos and pictures at a very affordable price. When looking for an action camcorder there are a number of decisions that will impact the quality of the video and images you are able to enjoy. What is an Action Camcorder? Action or adventure cams or camcorders are the newest item on the market in the camera and camcorder space. These compact devices look more like a camera but come with a rugged housing that can be mounted or attached to headgear, bikes or other objects allowing you to capture images and video without holding the cam in your hand. This has opened the door to a new level of video that can be enjoyed by others as well as the person taking the video. With its newness to the market there is a wide range of quality and accessories that can come with the action camcorder. Before deciding which model you want to purchase consider these questions. Where Will the Cam Be Used? This question will help you decide whether you need it to be water proof and if so, how deep can you go. Does it need to be drop proof and if so how far can it fall. The activities you participate in will largely decide what features you need to set as a priority. How Will the Camcorder Be Mounted? Since these cams are designed to be used hands free the mounting is essential to reducing the number of accessories you have to purchase in addition to the camera itself. There are head mounts and bike mounts. Mounts that allow you to put it on the end of a snowboard or on a pole or tripod. Based on where you will be using it think about what mounting devices you also want to have in order to use it conveniently without a lot of additional purchases. Do You Need a Carrying Case? Back to where you will be using it a carrying case is not just a regular soft sided bag. These are typically form fitting rugged cases that will withstand similar treatment as the camera. Will you carry the case up the mountain and shoot from a ledge or just put it on a head mount? When you go snorkeling will you carry it in a case until you reach your dive site or take only the camera. The Video Resolution is one of the most important features to your camera because it will determine the quality of the videos you are able to achieve. There are three different types of resolution standard, HD or high definition, and 4K. Standard resolution is 720 X 480 and provides a decent picture much like analog TV versus HD TV. Full HD has become a lot less expensive and can now be found in even inexpensive models. HD can be either 1280 X 720 or 1920 X 1080. The latter is the better quality. It can also be either I or p, with the P being the better quality. So a 1080P is the best HD quality available in the HD category. Higher end models may feature the 4K which is the newest HD version and gives you 3840 X 2160 pixels per frame. Connectability offers the ability to share your videos with friends and family or the world. There are three common types of connectivity options. These are Wi-Fi, USB ports and HDMI ports. Wi-Fi typically runs off an app that allows you to use the device remotes and allows you to transfer the videos or images through Bluetooth capability. USB ports are used with a cord attached to the device for data transfer and HDMI cords give you the ability to show the images or video on a television. Zoom Capability is often not available on these devices but would allow you to get closer to the action without physically moving closer. Waterproof and Shock Proof are qualities found on most action cams and give them a rugged feature not found on other devices. Video Time and Battery Life refers to how much video can be taken between charges. If you are in a remote location without the ability to charge the amount of recording time is important so you are able to capture the most important moments. Most cams give a little over an hour of actual recording time. Some give you the ability to record while the device is charging which is convenient if you are recording near an electric outlet. For many action applications this feature may not be valuable. When choosing an action camcorder consider where and when you will be using the device and then choose the features and mounting options that will meet most of your needs. These cameras are now very affordable and give you the ability to capture action footage like never before. You can mount it to a helmet on your head, to a bike handle or other appendage to create unique and exciting videos that capture life at its finest.